Today The Caterer reported that the CGA and Prestige Purchasing’s Foodservice Price Index (FPI) for March recorded the highest levels of inflation among ingredient prices since the dataset’s creation in 2015. The FPI found that food prices overall had risen by almost 10% year on year across the month with the highest growth categories including fish and fruit. 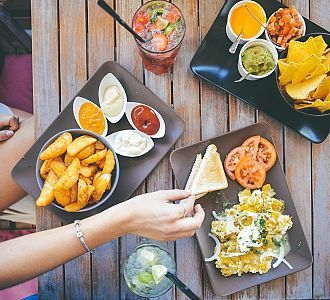 This is bad news for caterers who are already facing challenges on the high street in particular, with increasing Business Rates, rising employment costs and stagnant demand for many in the current economic environment. Efficient and effective cost control is important at any time, but when margins are being squeezed it is essential to ensure that, as caterers, we are safeguarding gross profit with appropriate controls on key costs as well as correct pricing strategies based on cost recovery and an understanding of market demand. Just in time. Keep an eye on how much stock you are holding – high stock levels mean less cash is available whilst also using up valuable space in the business. Take stock on a regular basis and monitor transfers. The key to successful F&B management is to keep monitoring how the business is performing with these key measures included on your dashboard: Average Spends, Sales Mix changes, REVPASH (Revenue per Available Seat Hour) as well as Actual and Theoretical Gross Profit percentages. Keep stock levels monitored with average days held calculations based on the monthly stock take values and focus on slow moving items. Finally, monitor wastage both during production and plate waste. To learn more about all of the above and how these techniques could help you in your catering business why not join us for a course. Our next course is on the 16th April in Manchester - to book click here. Alternatively a bespoke course could be really beneficial for your business and help to keep all the members of your kitchen and restaurant teams focused on the prize - producing the best possible food and beverage profit!